Not SAID in the above article about how happy we are to find nice warm fuzzy neighbors is that given the central star's size and the short periods of the foundlings, They probably have clouds that rain iron and lead.....in ..liquid...form. Do not think anyone will find that a hospitable place. Only use our starfaring neighbors will have of it is to skim that thick atmosphere for mining purposes...from the safety of space and at high velocities with large Boussard collectors. ""And here we are—this would be our first one, and it's a milestone for TESS. 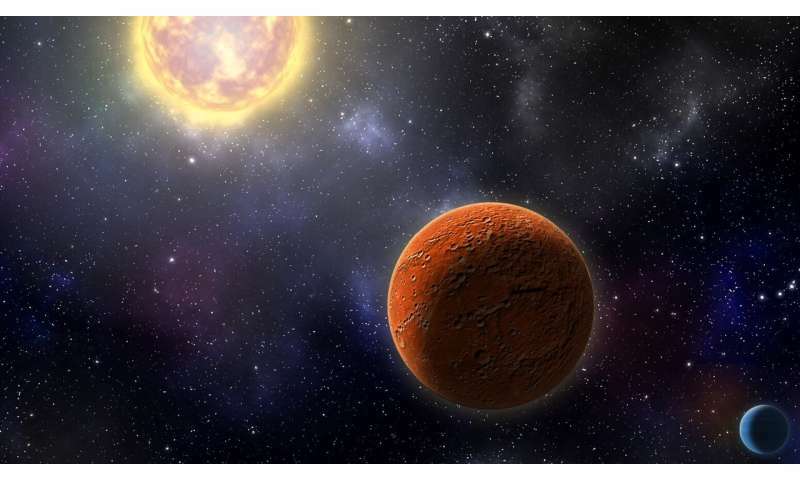 It sets the path for finding smaller planets around even smaller stars, and those planets may potentially be habitable."" This is all nice to discover, catalogue and dream that 'some day' humans might have the abilities to visit such places "out there". But spacefaring humans might only be limited to the planets and moons in the Solar System, due to many limitations that are physically and mentally restrictive. The Earth gave rise to the human species/race and is most suited in every way for humans, animals and plants to thrive; so that it may be idealistic to expect the eventual conquering of exoplanets by humans, but expectations are often rebuffed by Reality. And the Earth is what you know and love and couldn't get along without. It is home. Take good care of it and it will always feel good to come home. Is this the planet a planet hunter found? No, if it has a year of 36 days, and its rotates once on its axis every 36 days, it will show the same face to its star permanently. It will be what is termed 'tidally locked'. Just as the Moon is with the Earth. If it didn't rotate at all one side would experience some prolonged darkness. And there is no way this planet, or its companion, could be considered habitable. The larger one orbits at ~ 0.19 AU, and has an equilibrium temperature of ~ 420 K (~ 150 C). Its smaller companion is even hotter. And the larger planet has no solid surface. ^^^^Good thing I'm here to continually correct your misunderstandings, isn't it? ^^^^^Granville, just give up, yes? This is essentially a proof of concept observation. It can detect these planets. That is all. jonesy> ^^^^^Granville, just give up, yes? This is essentially a proof of concept observation. It can detect these planets. That is all.